BillyTheTree, the ultimate provider of unique jewelry and specialty items, has recently added a new brand of watches to its extensive collection of jewelry. Bering watches exemplify the pure, simple elegance of the Arctic landscape that inspired their design. The timeless beauty and long-lasting materials that characterize the watches set Bering apart from other watch brands in the industry. BillyTheTree is thrilled to add a new coveted brand of watches to its repertoire of unique, high-quality items available through its website. Known for providing customers with specialty jewelry made by exclusive brand names in the industry, European watch designer Bering was selected by the retailer as the perfect enhancement to its catalogue of fine accessories. 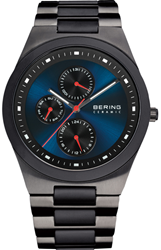 Bering Time is well-known in Europe as one of the best new watch brands in the market, winning the watch brand of the year award in the U.K. in 2013. Bering’s watches embody the serene and mystic beauty of the icy North Pole, originally inspired by the Danish owner’s Arctic excursion and the awe he experienced during that encounter. The name itself was taken from the Bering Strait in Alaska, which was named after a fellow Danish explorer back when the territory was originally being discovered. Bering’s founder, Rene Kaerskoy, believed the name would perfectly reflect the watches’ extraordinary hard materials in sync with their extremely flat, yet breathtakingly graceful designs. BillyTheTree’s recently acquired selection of Bering watches include over 177 new items, available in a variety of colors, styles, and designs to choose from. The specialty retailer has stocked a wide range of options for both men and women, including solar or quartz technology, stainless steel, leather, or ceramic strap materials, and numerous other design features to narrow the results down to suit one’s interests. No matter what the preference, all of the watches are designed to reflect a minimalistic Danish design with streamlined forms and are created using strong, resilient materials. Bering uses high-quality materials able to withstand harsh conditions and environments, including HighTech-Ceramic and sapphire glass, known for their scratch resistance and durability. HighTech-Ceramic is a very light, heat resistant material with an exceptionally smooth surface, giving the material a unique feel that provides its users with a distinctly comfortable wear. The timeless beauty and long-lasting materials that characterize the watches set Bering apart from other watch brands in the industry. The newly acquired collection of items is available for purchase on BillyTheTree.com, ranging in price from $99.90 to $349.00. To learn more about BillyTheTree, or view its collection of stylish Bering watches, please visit BillyTheTree.com. Contact store owner Robin Weber with inquiries about BillyTheTree or any of its specialty products.